A complete fashion design workshop that makes you the designer! Super-clear line art and mix-and-match vinyl clings make it easy to assemble a bazillion different outfits. 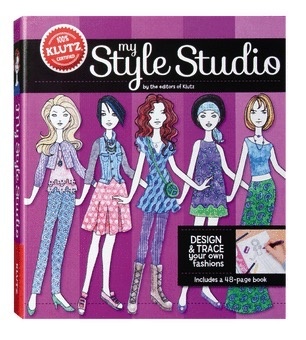 Trace your fashion and add your own stylish touches freehand. Colored pencils and textured pattern plates make adding color and pattern a cinch, and the included fashion book has pages and pages of inspiration to get you started. The custom work surface is portable, making it the ideal art table for fashionistas on the go...because you never know when fashion genius may strike. Comes with: 48 page book, 4 pages of line art on plastic clings, line art of a figure on clear plastic, 2 pattern plates with 4 textures each, 8 colored pencils, 40 sheets punched tracing paper, sketching pencil, pencil sharpener, eraser, fine-tip pen.